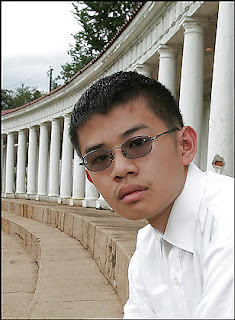 David Banh, an 18-year-old from Annandale, just graduated from the University of Virginia in one year. With a double major. David Banh of Annandale took more than 60 credits at U-Va. within a year. His college education, almost entirely covered by a patchwork of scholarships, cost him about $200. And he sold back textbooks for more than that. Now he's starting graduate study at U-Va. with a research grant. So at this point, he's technically running a profit. He's upending two trends: Most students take longer to graduate than you might think -- about two-thirds of freshmen at four-year colleges in Virginia manage to finish within six years. And tuition gets more expensive every year. He was helped by the fact that U-Va., as a public school, costs a lot less than most private colleges. And that the university accepted many of his Advanced Placement credits from high school; many of the most selective private schools wouldn't. As it was, he doubled up on course credits and took more physics over the summer to finish his second major. Many professors would like students to explore and experiment in college rather than cram in as much as possible at top speed. Still, "I've never seen anything like that before," said Donald Ramirez, professor and associate chairman of mathematics at U-Va.
"He's one of a kind," said Vicki Doff, his counselor at the competitive magnet Thomas Jefferson High School for Science and Technology in Fairfax County. "Absolutely amazing kid academically, incredibly persistent, bright, focused and determined. His academic record was second to none. I've been here over 20 years, and I've never had a student take the course load he did in his years here." She used to worry he was doing too much. "And he usually proved me wrong." Banh was born and grew up in Fairfax, the eldest son of parents who came to the United States from Vietnam in the 1980s. Even in elementary school, he was trying to get ahead. His bus driver in kindergarten told his mom that the boy would do problems or talk about lessons on the bus with the other children, Kim Banh said. In second grade, he told her he was bored and wanted harder math problems. David seems to have adopted Mr. Edison’s famous adage while still in high school, taking as many advanced placement exams as he could and amassing an incredible 72 credits. He wisely used the teen years as they were intended, as a training ground and launching pad for the rest of his life. With that hard work done, David was halfway to his bachelor’s degree before the start of his first college semester. At that point he could have breezed through a normal college course load and still finished two years early. But he didn’t. Instead he chose to continue the approach he took in high school: Hard work. But after signing up for 23 credit hours the first semester—most students take around 15—he found himself still with more free time than he had in high school. Knowing that he would have to take out student loans if he continued a second year, David decided it made a lot more sense to just finish in a single year. An unheard of 37-credit second semester completed his mathematics major, with a final summer class getting him the three additional credits he needed for a double major in physics. He graduated last month. From what I can gather from the articles available, David is not a Christian. Yet we can still commend his work ethic. The way he continually pushed himself in high school and college to “do hard things” is an excellent example to rebelutionaries. With his brains and talent, David could have easily coasted through high school and college. Instead he diligently applied himself to a season of intense study; even when it kept him from other enjoyable activities; even when his friends thought he was slightly insane. What was his motivation? Saving time and money. 1.) A higher purpose: To glorify our Creator. It’s not about us. 2.) A greater strength: The work of the Holy Spirit. Not our own strength. 3.) A sweeter joy: Knowing Christ as Savior. Saved by grace alone. Friends, these are priceless biblical truths. Stories like David’s turn our society’s expectations of teenagers upside down. They demonstrates how capable young people can be if they apply themselves. They prove the power of a young man dedicated to a dream. But friends, as Christians we have a calling that is higher than any earthly dream and a power beyond any human strength. I love kids, and they represent the reason I breathe for!